Why would anyone want to shop for books somewhere besides Amazon, a company world-renowned for its unbeatable prices and unparalleled customer service? Because the company’s success, amplified by its Kindle sales, is quickly edging out physical bookstores and publishers. If you prefer to support smaller businesses, you have plenty of opportunity to do so — there’s still a huge literary world outside of Amazon. Where else can you find deals on new and used books, you ask? Here are five great alternatives. Before there was Amazon, there was your local bookstore. From handpicked selections to staff recommendations, independent bookstores offer a personal touch you won’t find at large chains and online retailers. And by shopping close to home, not only will you get great prices on used titles, you’ll also support your local economy. Use the IndieBound and American Booksellers Association search tools to identify independent bookstores in your area. If you don’t want to give up the ease of ordering books online, consider shopping at Powell’s, a Portland-based independent bookstore with a broad range of new and used titles. What can you do with all the books you’ve accumulated but don’t plan on reading again? You could donate them to charity or sell them to a used bookstore, but there’s a third option: swapping them online. BookMooch lets you list all the titles you no longer need and compile a wish list of books you do want. Every time you add a book to your inventory, users who’ve wish-listed that title will get an email notification with the opportunity to request it from you. For every book you send out, you’ll gain points that you can use to request books from other users. Although a majority of users are based in the United States, you can mooch from and send books to users internationally for extra points. PaperBackSwap offers a similar service. After listing your first 10 books, you earn two credits to start requesting other users’ books. You’ll get a credit for every book you send, and double the credits for audiobooks. If you enjoy reviewing books online, consider signing up for free advance reading copies, also known in the book industry as ARCs. Publishers release a number of pre-publication editions of their books to gain publicity through critics’ reviews and celebrity endorsements. But you don’t have to be a star or literary expert to snag an ARC. The industry has realized the power of reviews by everyday readers, so if you’re the kind of reader who posts reviews on Facebook, Goodreads, Amazon, BookLikes, LibraryThing or your own blog, you’re just the person publishers are looking for. The book-cataloguing site LibraryThing offers a free Early Readers program. Check every month to find a new selection of printed books, e-books and audiobooks. Request all the books you’re interested in reading and, depending on a variety of factors associated with your LibraryThing account, you may win the chance to read and review up to two books. For more ARCs, check out the First Reads program at the literary social networking site Goodreads. Unlike the Early Readers program, there’s no monthly rotation — publishers and authors can list new books at any time, and you can search by genre or listing date to find new titles that interest you. There’s no limit on the number of books you can request, but it does help your chances if you’re active on Goodreads and generally review the books you receive. If you read e-books, sign up for NetGalley, where you can request digital copies of books for your e-reader, tablet or computer. The site features books from hundreds of publishers in the United States, Canada, United Kingdom and Australia. Book sales are the perfect opportunity for you to fill your shelves without breaking the bank. Your local library and nearby nonprofits probably hold them annually or seasonally. Some sales let you purchase books much like a bookstore, with each title listed at a specific price. But if you’re lucky, you can find sales where you can buy books by the pound or even at unbeatable bargains like $5 a bag. Check out BookSaleFinder.com to identify the best book sales in your area. No, you don’t get to keep the book, but your local library is a great way to get your hands on a huge array of titles for free. You’ll save money by borrowing the book and actually reading it before you decide whether you need to own it. Despite their old-fashioned image, libraries are usually on top of the latest technological trends, including e-books and downloadable audiobooks. Browse your local library’s catalog from home to see just how much it offers. If you have access to multiple libraries in your area, check the international catalog WorldCat to identify the nearest library with the title you want. Readers in California, Nevada, Oregon and Arizona should check if their local library is part of Link+, a network of public and academic libraries that let you borrow among them for free. Link+ members have access to millions of books (printed, electronic and audio) from more than 50 libraries. Residents of Ohio can use OhioLink, a network that includes the State Library of Ohio and the libraries of 90 universities, technical schools and community colleges. Alternatively, you can take advantage of interlibrary loans. Available at most libraries, interlibrary loans may cost a $1 or $2 fee but will give you access to titles across the state, country or even continent. They’re a great way to get ahold of rare and expensive titles you can’t find anywhere else. 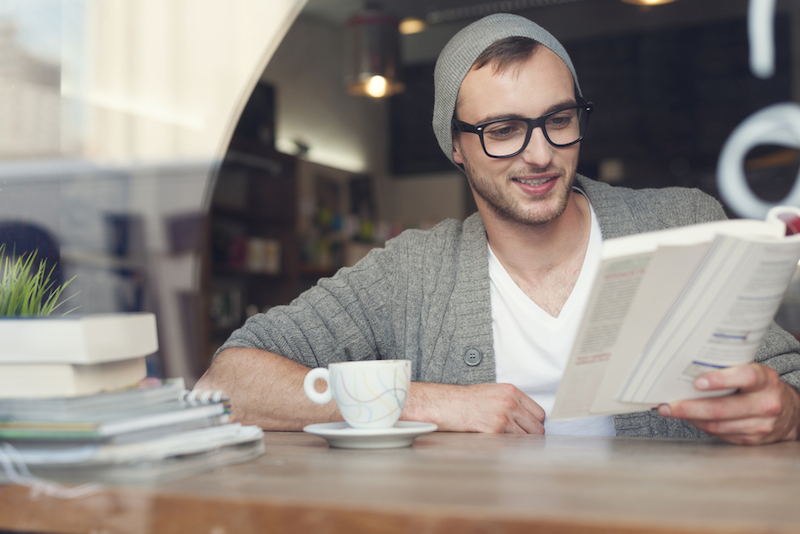 Man reading in cafe image via Shutterstock.